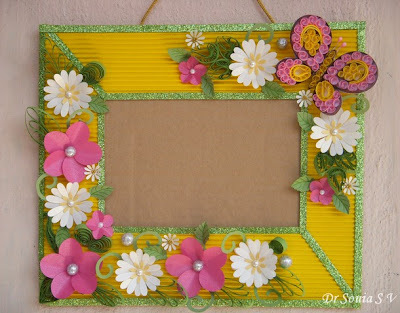 Dear friends, since a craft blog is just a hobby or a side business for 90% of us one of the things we would all like is to blog with the minimum of time investment and yet reap rich rewards in terms of blog popularity [ translating to more followers, friends and business selling whatever craft or craft product you sell].Sharing a few tips and tricks I have learnt from blogging and my blogger friends to balance out the act! 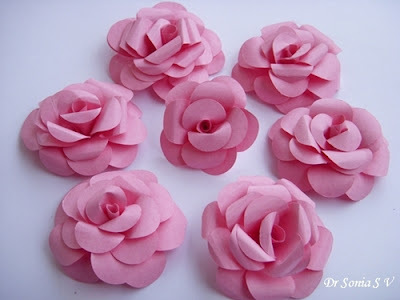 We all wish to have followers and in turn follow blogs we like. But many a times you may have had to scroll all over a blog to find the follow button and at times new blogger’s even neglect to add one! Some bloggers sidebars have so many links that the most important “Follow me” button gets lost somewhere!! Check on your blog the position of your follow/subscribe button and place it right at the top of your side bar or at the top of your blog – this makes it easy [and even tempting] for visitors to follow you!The pic shows how my friend Barbara proudly displays and invites her followers! 2. 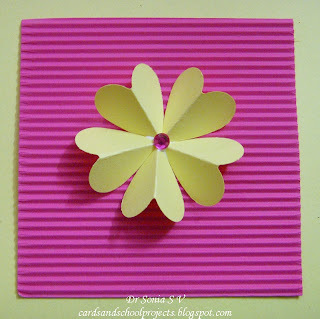 Following a blog? -Leave a calling card! It is so thrilling to log in and see you have a new follower isn’t it? You would of course like to know who it is but Google friend connect doesn’t always give that information. So when you decide to follow a blog let the blogger know and leave a comment with a link to your blog. You will almost always get a thank you visit and they may even follow you too! 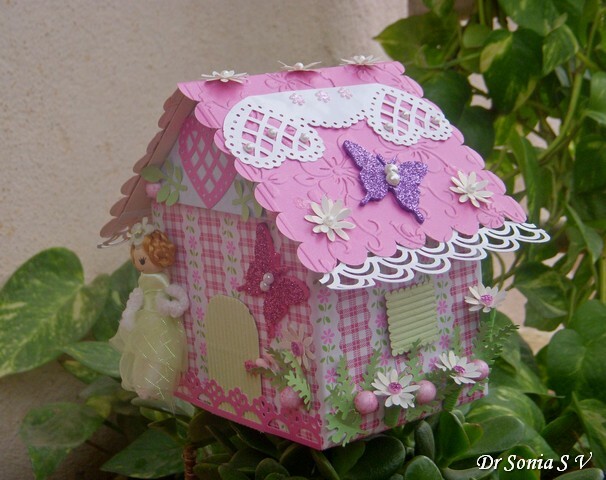 I love to comment on blogs I follow and always try to visit bloggers who comment on my blog. Who doesn’t love comments? We all blog to share and interact so the next time you see something you like, do let the blogger know and spread some love and cheer! 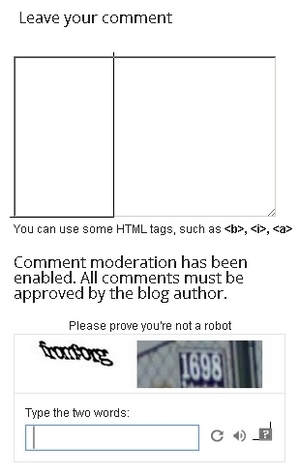 Say No to word verification – many new blogs especially have word verification enabled on the comments. 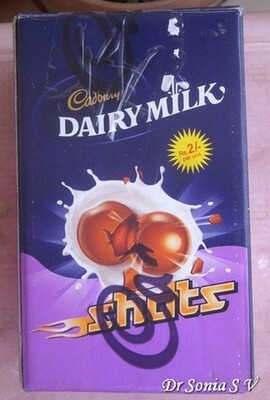 Its a big turn off and time stealer as it’s so difficult to decipher the double words and even more tedious to type it . If the blog you are visiting has word verification enabled by all means comment but let the blogger know and request they turn it off. 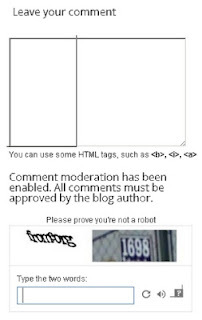 Word verification does not prevent spam only comment moderation can prevent spam. How to turn off word verification:Got to Dashboard, click Settings--click Posts andComments--scroll down to "Show word verification ?" and click on "No". Use keyboard aids or shortcuts software-my secret is a freeware called speed typing which helps me add favorite phrases [such as saw link on MIM], my name and blog signature in my comments by typing just a few letters! Email- if you have linked your blog to your email address each time a comment is left on your blog,you get an email. If you are someone who is comfortable emailing you can just “reply” to the blogger with a thank you note. The catch here is if the commenting blogger has not linked her email to her blog account [called “no reply blogger”] you will not be able to reply to her. 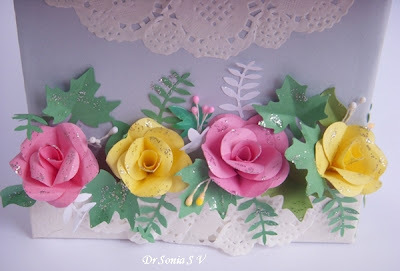 I personally don’t like to email to comments as I’d rather enjoy a visit to the blog, see my blogger friend’s new creations and leave a comment. Reply button-This is so easy to do as you can reply to the comment on your blog itself. It makes your whole comment section interactive and all your blogger friends can enjoy the conversation! The only drawback is that the blogger who commented may not be dropping back in to see if you replied! This is especially great in a challenge blog where everyone can see the replies. 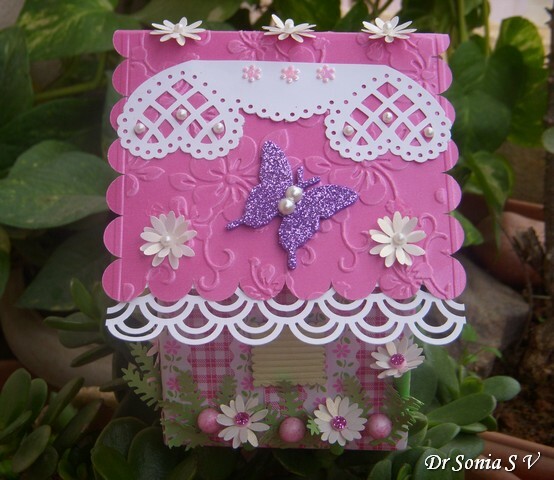 Sunehra of Itsy bitsy does such a commendable example of this type of interaction at the Itsy Bitsy Challenge blog she hosts! Blog return visit –This is in my opinion the ideal response! 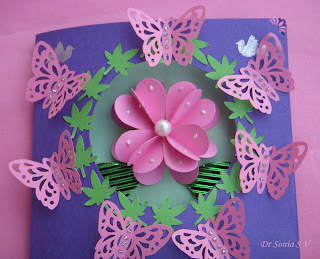 You can see the blogger‘s creativity [so much more appealing than an email screen!] and the blogger will be happy getting a comment on their blog! I especially find it easy if the commenting blogger has left a link to the blog in the comment itself. 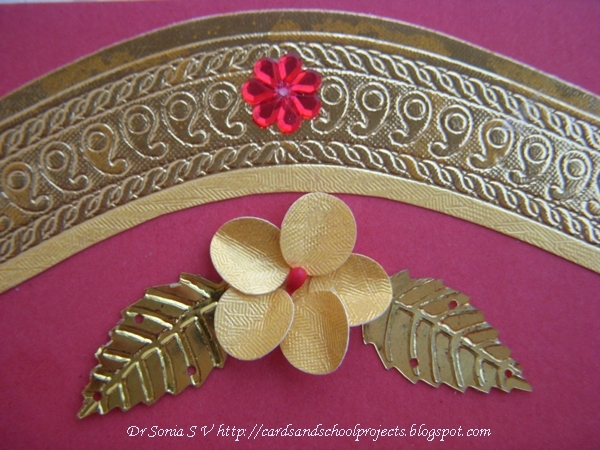 I love the clickable signature which Lisa of Mermaid crafts leaves in her comments. I recently discovered that leaving signatures in comments is a controversial practice as it may be interpreted as spam--dont know how the craft blog community feels about it .Personally I feel its easier to visit the blog if a clickable link is there!What do you feel my friends? Comment on their new blog post - Sometimes when 2 people follow each other’s blogs and you have developed such a good relationship with your blogger friend, no emails or replies are required….each comments on and supports the others new blog posts as a routine. I am so fortunate to have such a comfortable relation with many of my blog readers .When I see their post on the dashboard I pop by and comment and they in turn do the same! There must be a post or tutorial you are proud of…give it more visibility and life by adding a picture link on your sidebar. 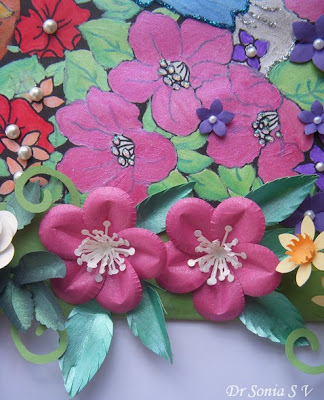 Khadija of creative mind does this amazingly well. 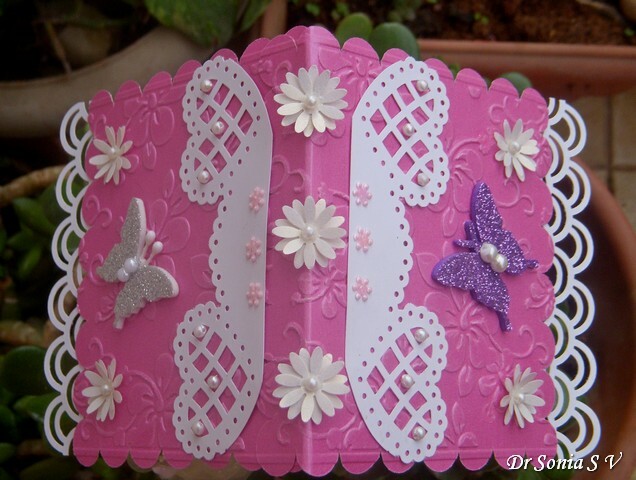 At the time of writing a blog post or later, add relevant labels such as “ Card , Quilling” etc . 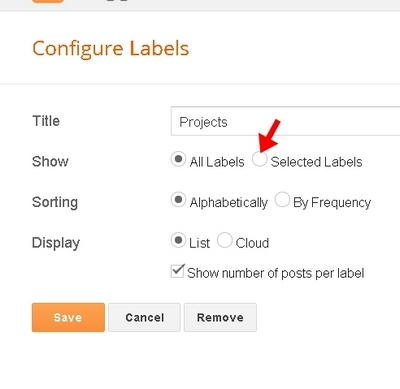 Do add the labels widget on your sidebar too. This is such an easy thing to do but surprisingly many bloggers don’t bother! It just makes it easier for a visitor to explore your blog by clicking on a topic of interest to them ! 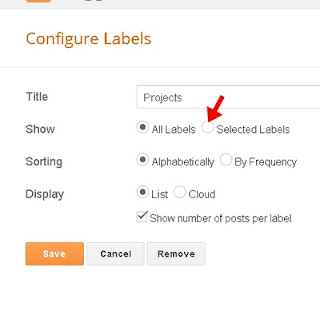 Caution: dont let your labels list grow too long [mine is too long and I need to do some cutting and chopping] .A trick to avoid long labels list is to choose the labels you want displayed by clicking select labels. Though I had already written about resizing photos in blogger photo tips I am sharing once again the importance of this as I came to know recently that a couple of my blogger friends [who had been blogging since 2010/2011 only] had exhausted their free storage space at Picasa [the default image storage site for blogger]. Picasa provides only 1 Gb of storage for your photos and if you exceed that you have to pay for it! Once you log into to your picasa account scroll down right to the bottom of the page and you will see what % of your free storage you have used. For the newbie SEO or search engine optimization of a website helps search engines such as google index your website! 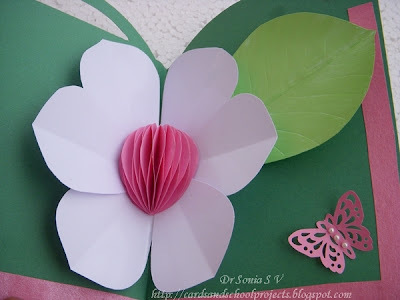 For a craft blog one of the simplest SEO tactic is to have good blog post titles. Your title need not sound witty it just needs to be something someone would search . 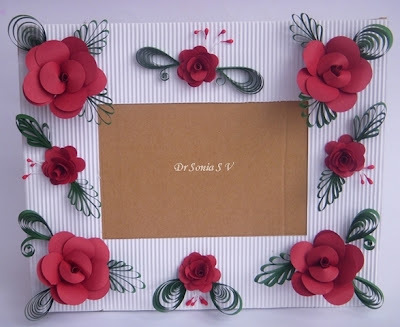 Check out this post by Dr Jaya which she has titled as "Flowers with square punch"! 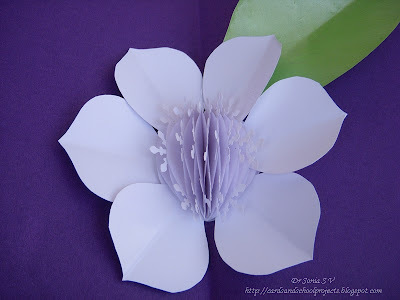 Hers is a relatively new blog but search "square punch flowers" on google and her blog turns up on the first page which is an achievement for a new blog! 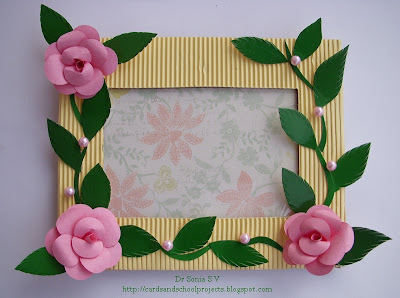 While you are at her blog do check out her other projects and especially her blog post titles which are so SEO friendly!Hers is one new blog which has the potential to become very popular! If you are interested in SEO there are lots of other complicated stuff you can do but maybe we crafters would rather spend time crafting than bother with such technicalities! If you are a new blogger you have to go out there interact and comment on blogs in your niche as otherwise you wont improve your blog visibility or grow your blog readership unless you are an SEO expert [which most of us aren’t!]! 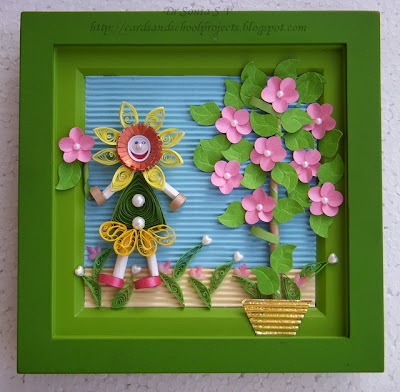 Join craft challenges – you don’t have to create a masterpiece to submit for a challenge -the point is to have fun and learn! 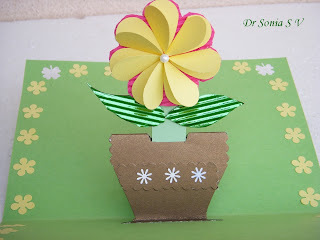 The best resource for craft challenges is Paper Playful. 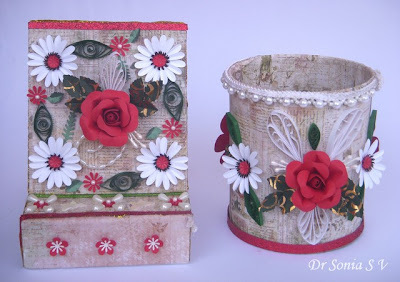 To help Indian crafters, I have created an Indian Craft Challenges page which I update with the current challenges. 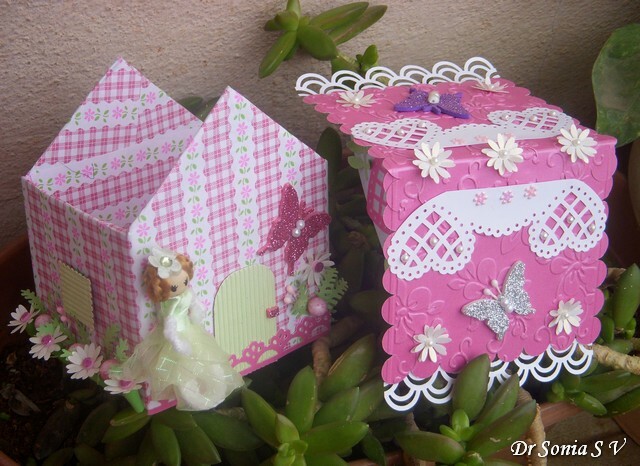 Join linky parties-My favorite Papercrafters linky party is MIM and through MIM I have found so many blogger friends like Loz and gained so many followers too. 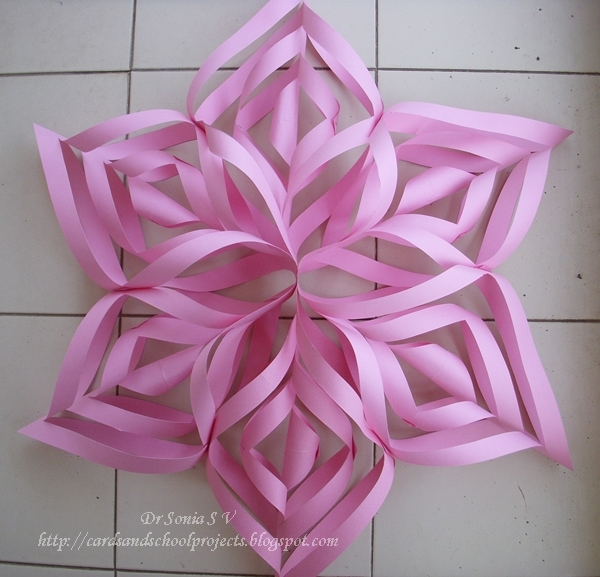 If you can master the art of linking to Linky parties your craft blog readership will grow in leaps and bounds! Edited: MIM has been discontinued! Share good photos- No matter how beautiful your project is in reality if your photo is all blurry, grainy and dark, your readers just wont be able to appreciate the real beauty! You don’t need expensive cameras to take good photos [though having a canon would maybe make editing unnecessary!] .To know what I mean head over to Erum's blog..her photos are stunning and some of them were taken with a mobile!! I hope this post will be useful to both newbies and experienced craft bloggers. Do share your tips too as we are all learning! I am always anxious when I have to do a DT project and tend to fall back on what I love to do [which is recycling,and punchcraft]. 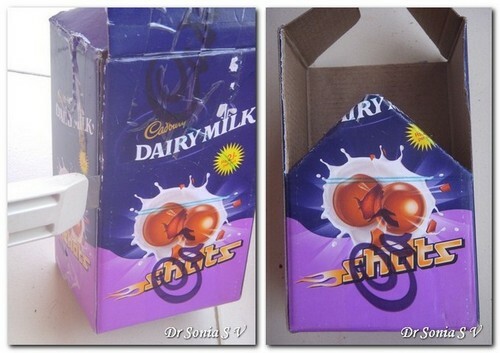 I recycled this cardboard chocolates carton to make the house shaped box! 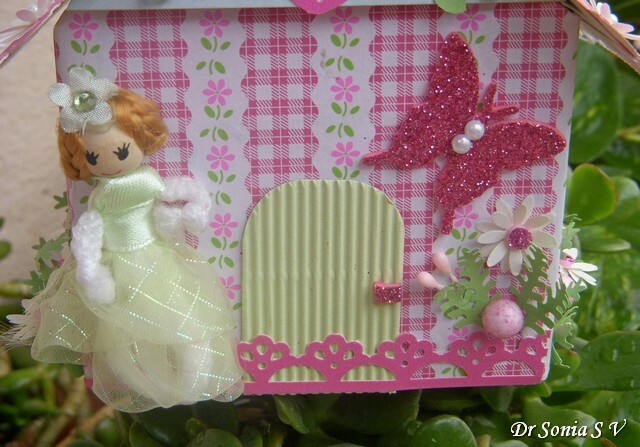 I used die cuts, glitter and flowers on the roof lid and base of my house shaped box. 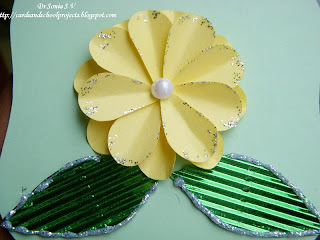 I made the tiny daisies using a medium daisy punch and punched out tiny circles from glittery foam for the flower centers. 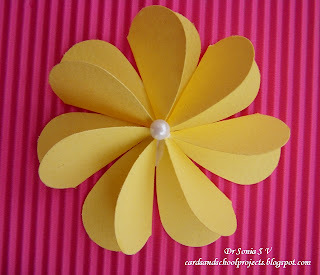 ]Here is the link to another type of punchcraft daisy tutorial]I wanted the flowers to jut at an angle so quilled some bells shaped stems and used regular white glue to stick it to the walls of my house shaped box. 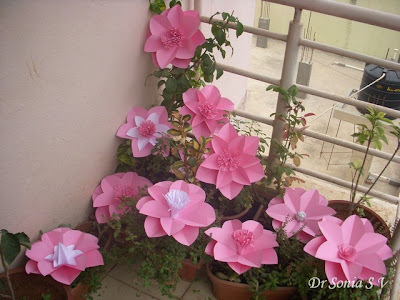 The pale pink balls are thermocol balls! 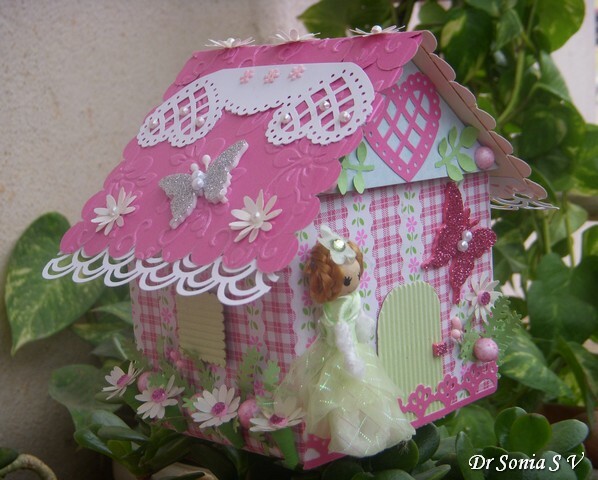 [so cheap and such fun to craft with ] The cute little doll is a ten rupee find from the local market.I die cut butterflies from glittery foam using my big shot ; and hand cut a door for the house box! 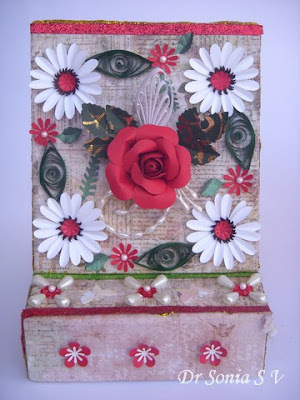 Added more punchcraft flowers with quilled stems on the other side of the house shaped box. The little windows were die cut from corrugated card using scallop square dies.This angle shows the back of our house shaped box. 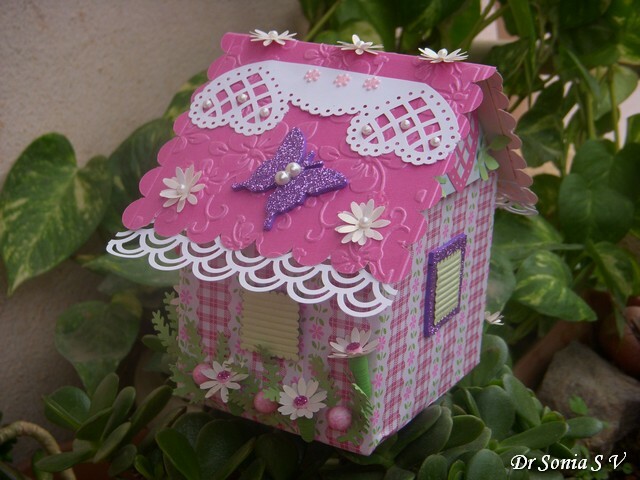 The tiny punchcraft daisies are also made from pearlised paper so they shimmer on the roof of the house box ! This is a recycling craft and recycling an old box is the easiest way to make the house shaped box as you already have a sturdy box with you and not much scoring and measuring is involved! 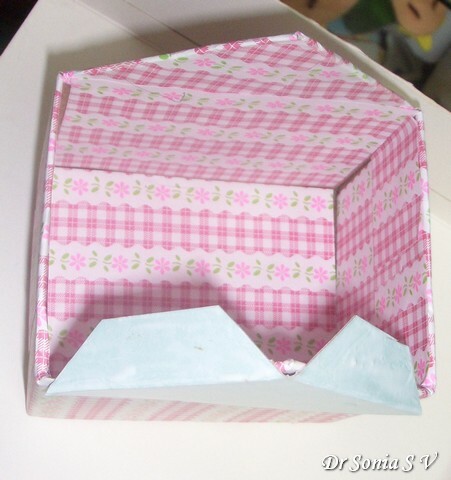 Cut along the box corner till the horizontal mark and then cut out the house shape marked earlier as shown in the box tutorial. If you are lucky enough to have a little helper--this is the stage they can help while you grab a cup of coffee!Here is my little one helping to glue pattern paper on our house box. 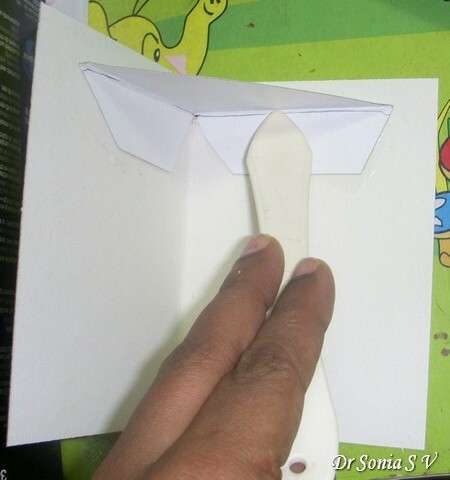 Bend it over to create a roof.Mark and cut off extra lengths of your roof. Marking is easier if you invert the box as shown in the picture of the box making tutorial. 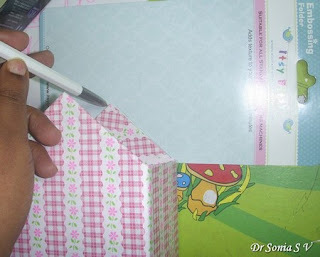 Place it on the outer and top part of your house as shown and apply glue on the tabs as shown in the photo of the box tutorial. The photo below is the aerial view to help you understand better this step of making the roof lid of the house box. 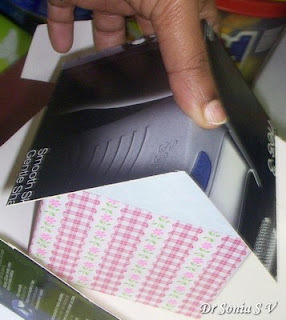 Firmly press down your roof on the glue tabs of the triangle as shown in the photo of the box tutorial. 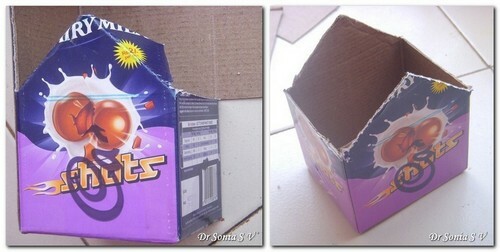 Remove the roof and press the tabs well from the inside as shown below in the photo of the box tutorial. In the similar fashion make the triangular lid on the other side. 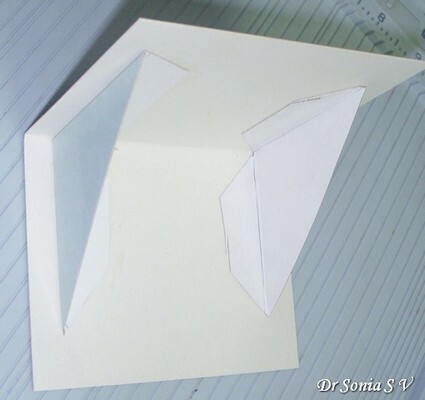 Take your time and fiddle a bit in this step as the placement of these triangular pieces determines how snugly your roof lid fits your house box. 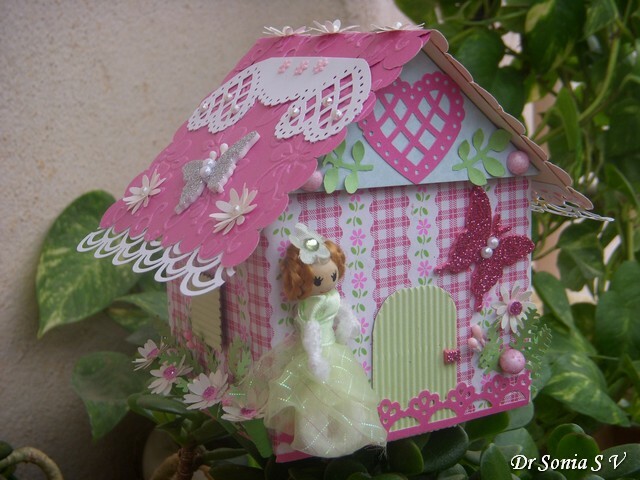 Once the framework of the roof is made you can decorate it as you wish. 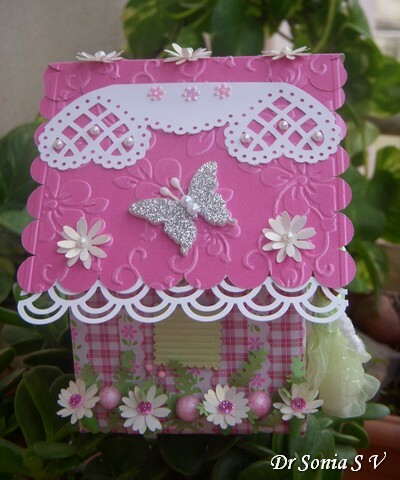 I added some die cut and embossed pearlised card over the roof base and added die cut butterflies and punchcraft floors to jazz up the roof of my house shaped box. 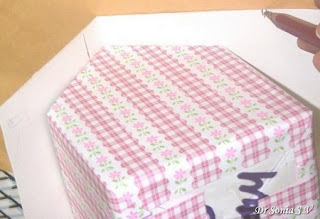 I made my lid to fit snugly so that it does not fall of easily. If you find your lid is loose, you could add a latch of velcro or ribbon on the lid of the house box. I hope you enjoyed yet another recycling project. Do tell me what you think. 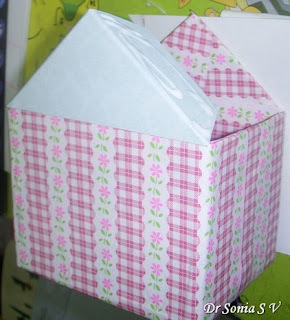 Here is the link to other Box tutorials. 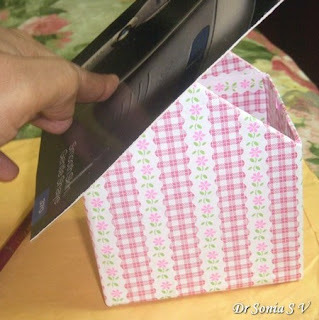 Edited: This House shaped box came top 3 at Snehal's Box Challenge!